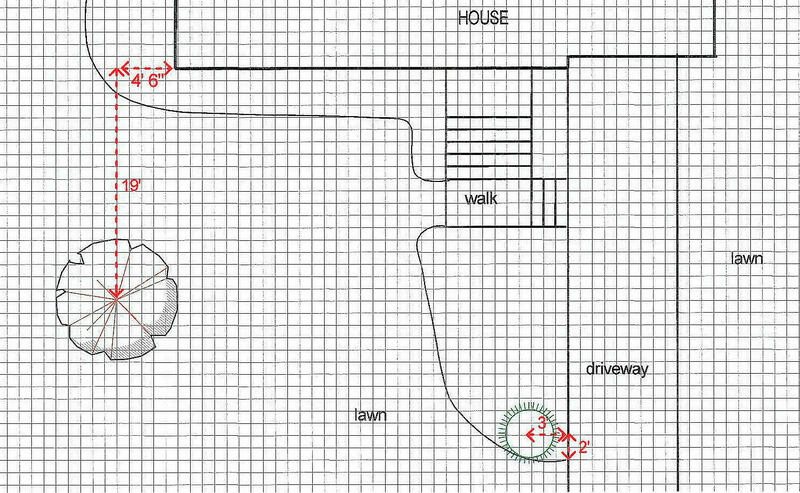 Place the plants the same way you measured for your planting bed. Find a good spot to begin and create a second spot from which to take the second measurement. Place the center of the plant pot or balled and burlapped (b&b) shrub or tree at the designated spot. I like to place all the plants first then adjust the distances. Make sure you turn your plants so that their best side is facing the side from which they will be viewed. Begin the hole by digging from the edge of your plant pot angling toward the center. Continue digging in around the pot, outlining it. Then, put the pot aside while you finish the hole. Measure the depth of the root ball or pot; you can use the handle of your shovel to measure the length or your trusty retractable tape measure. The hole you dig to plant your tree should be slightly less deep than the root ball. 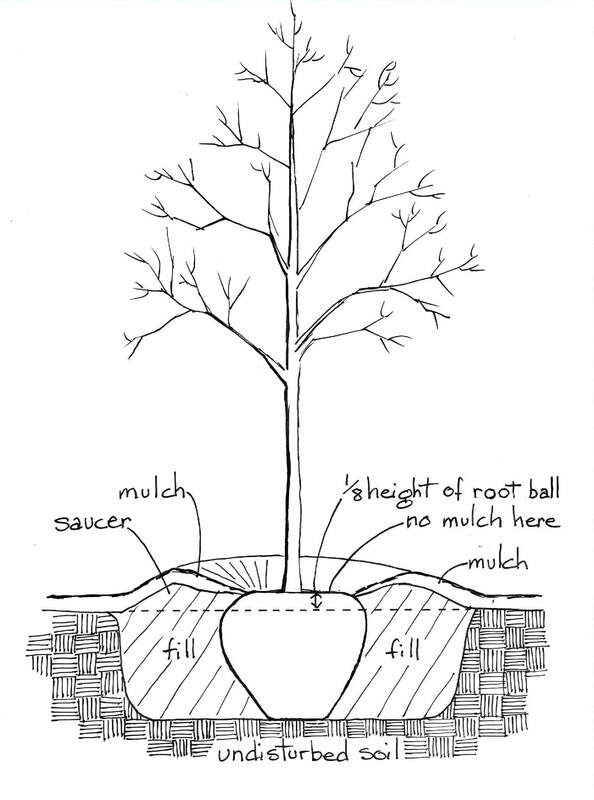 Ideally, the tree should sit on undisturbed ground at the bottom of the hole, with 1/8 of the root ball above the existing grade. The width of the hole should be two to three times the width of the pot or root ball. The sides of the hole should be vertical or angled out, and the surface roughed up. If you find the roots are circling inside of the pot, gently, spread some of them out so they will be growing into the soil and not continuing to circle in the planting hole as they grow. If the tree is wrapped in burlap and tied with twine, be sure to remove all of the wrappings, cutting them away if necessary. Backfill with the same dirt that you removed from the hole. If you are planting the tree outside of a prepared planting bed, don’t amend the soil with fertilizer and lots of extra organic matter, at the most, you can add a little compost to the backfill. Don’t cover the top of the root ball with soil. 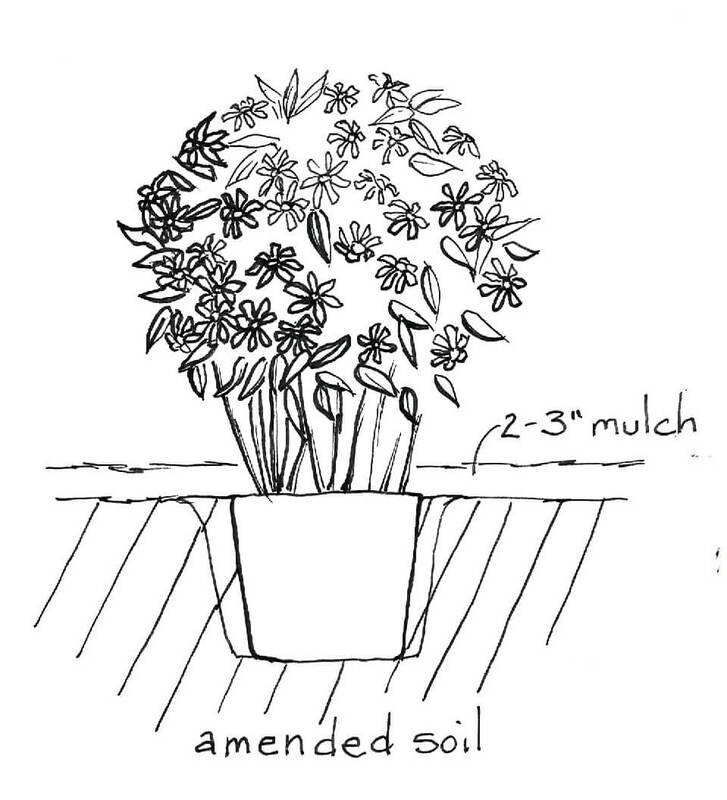 Form a saucer around the planting hole by mounding the soil into a 3” raised lip. Cover the area with 2-3” of mulch, being careful not to let it touch the tree trunk. Water thoroughly. Don’t stake the tree unless it is top heavy and likely to blow over in a strong wind. Plant a shrub the same way you plant a tree. Dig the planting hole 1 foot wider than the root ball on all sides. 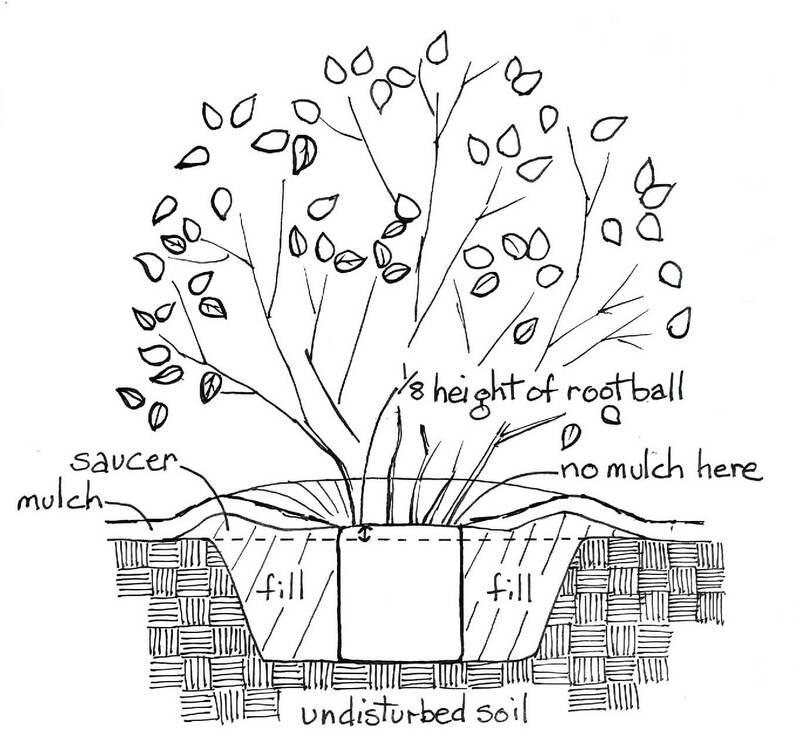 The root ball should rest on undisturbed soil with 1/8 of it above the existing grade. Score the sides of the root ball from top to bottom to a depth of 1-2 inches in four places and loosen any roots that are circling or massed on the surface. Backfill with soil from the hole. You may mix in few handfuls of compost. Be sure to remove any wrapping and cord or twine. Form a saucer around the planting hole with dirt. Cover the area with 2-3 inches of mulch making sure to not let it rest against the trunk or branches. Water thoroughly. Plant perennials in a garden bed where the soil has been loosened and amended. Please read Prepare Your Garden Bed for instructions. Dig the hole deep enough to place the plant at the same depth it was in the pot. The roots should be covered, the upper stems free. Score the sides of the root ball with a knife (serrated blade is best) and spread or crumble the soil and roots gently. 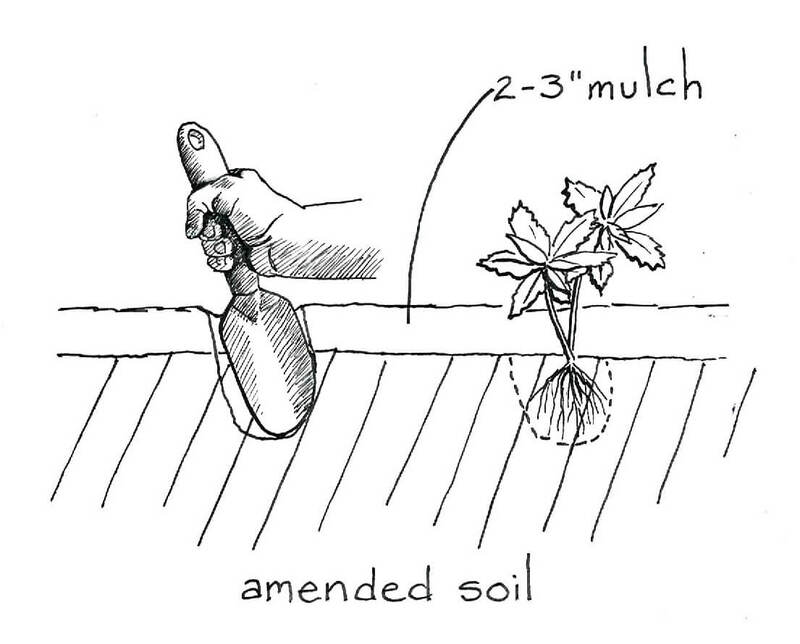 Plant, then cover the soil with 2-3 inches of mulch. Water thoroughly. Plant large annuals and groundcovers the same way you plant perennials. Small multipack annuals, groundcovers, and bare root plants can be mass planted in pre-mulched beds. Turn your hand trowel around and plunge it through the mulch and into the soil below to a depth that will accommodate the small plant’s roots. Pull the hand trowel back towards you, creating a space in the soil. Slip the roots in, making sure that they are deep enough to be covered with soil. Lift out your hand trowel, pat the soil over the roots and smooth the mulch around the plant’s top growth.